Amandine Atangana, first female professional video games developer in Cameroon in Kiro'o Games headquarters in Yaounde, Cameroon on July 10, 2018. Yaounde — Off a dusty path in the capital city, flanked by chickens roosting in the grass, one of Cameroon's most successful digital startups is capitalising on its success to foster a new generation of entrepreneurs. Founded in 2013, Kiro'o Games has grown to become Central Africa's first major video games studio. It draws on African mythology rather than Hollywood for inspiration, as in its fantasy role-playing game "Aurion: Legacy of the Kori-Odan". Today, Kiro'o's online educational platform Rebuntu, launched in June last year, trains young Cameroonians to navigate obstacles in real-life business. "Our generation has the duty to bring something really new that will finally generate growth," said Olivier Madiba, founder and chief executive officer of Kiro'o. They can also seek online and in-person mentoring from Kiro'o staff. Unlike neighbouring states, Cameroon has been relatively stable for decades, but is blighted by high youth unemployment. But Kiro'o digital communications head William Fankam believes there is another way: create your own work. "We are wall-breakers," he told the Thomson Reuters Foundation, adding that the gaming team is determined not to let the region's challenges halt their progress. 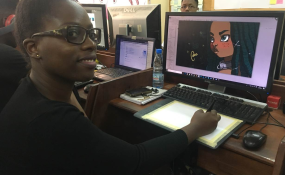 The company has broken down barriers in education, with its game designers managing to acquire expertise despite a lack of specialised training in Cameroon. The entrepreneurs' training programme aims to share Kiro'o's pioneering approach with others, he added. "We realised we can't evolve alone," he said. "We want to create an ecosystem where we'll have many startups with different services which would have an impact on the Cameroonian economy, and wider in Africa." Kenneth Fabo, who runs JeWash, a home dry-cleaning and ironing service in Douala and Yaounde, said the programme is helping him devise a crowdfunding strategy to grow his business. "They taught us a certain method that helped us prepare to fundraise effectively," he said, describing how he received training to ensure the business is managed transparently and responsibly in a way that reassures investors. Kiro'o Games - despite its unique selling point as an African company producing culturally relevant video games - struggled to raise money at the start, said Madiba. "All conventional investors, the banks, the businesses, rejected our project," said Madiba, whose childhood ambition was to make computer games. "So we decided to invent our own fundraising process." Through a combination of tactics including YouTube videos, a campaign on creative funding platform Kickstarter and tapping non-conventional backers like the Cameroonian diaspora, the group went on to raise 130 million francs ($227,000) from nearly 90 international investors - "a dream that everyone told us was impossible", said Madiba. Arielle Kitio Tsamo, founder of CAYSTI, an initiative that trains youth in technology, and winner of the 2018 Norbert Segard Foundation prize for African innovation, said her company had benefited from the Kiro'o support. "They helped us structure our business model," she said, adding the scheme also connected her with government partners. "We want to motivate youth to consider entrepreneurship - and specifically technological entrepreneurship - as a potential way of poverty alleviation," said Tchoumba. "For every company that is created, there is income for the country, there's employment for the youth," he said. Multinational companies are also showing interest in West Africa's startup scene. Since 2017, Google has been running Launchpad Accelerator Africa, a training scheme for promising startups. In June, it began accepting applications from Cameroon, Senegal and Ivory Coast, among others. Challenges include a lack of basic business necessities, such as a reliable power supply, with sub-Saharan Africa having the world's lowest household electrification rate. Kiro'o's Madiba admits dealing with power cuts and other fundamental problems is tough, but says the group's resilience has spurred it on to greater things. "When we started we were just passionate - but at a certain point we became a symbol of something, and we didn't anticipate this," he said, referring to the frequent emails he receives from Cameroonians struggling to set up a business. Many tell him they do not give up because Kiro'o shows that success is possible. "It's not only a job - you are building a legacy," said Madiba.